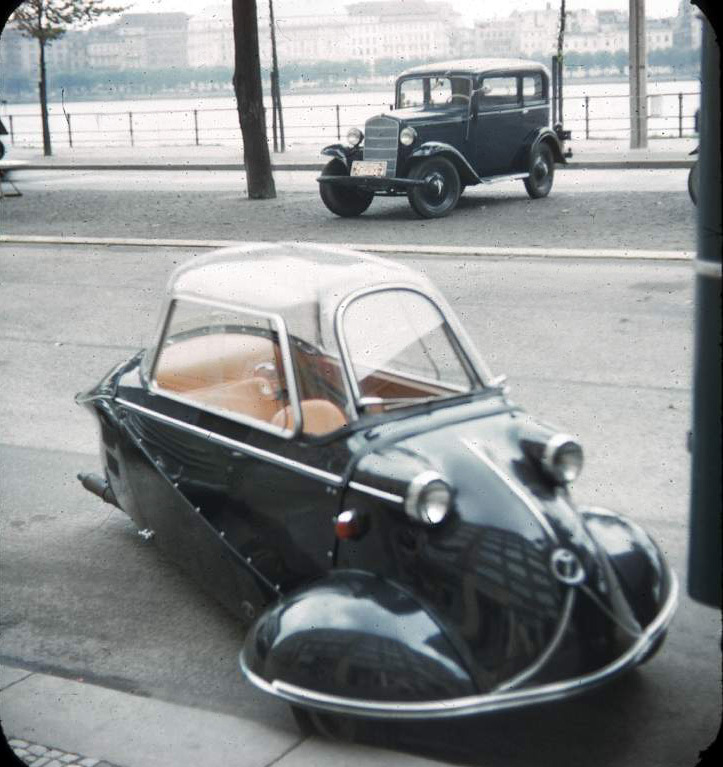 This photo of a brand-new Messerschmitt Kabinenroller KR175 was taken by my friend Herb Grosch August 30, 1954, Hamburg. The Kabinenroller was a microauto produced by Messerschmitt (a German aircraft manufacturer) beginning in 1953, designed by aircraft engineers and not unlike a cockpit in appearance. It has two wheels in front and one in back, a kick starter and other motor-scooter-like controls (handlebar for steering with twist-grip throttle and clutch lever), a hand-operated windshield wiper, and no reverse gear (hence the poor parallel parking job in the photo). The passenger (copilot :-) seat is behind the driver seat. BUT WHERE IS THE DOOR? Weight: 230 Kg. Cost: DM 2100, or about 500 US 1955 dollars. 65,000 were manufactured until production stopped in 1962. Later models had automobile-like controls, a reverse gear, and eventually four wheels. Klein(st)wagen were an adaptation to the general market of the Krankenfahrzeuge (cars for people with war injuries) that began to appear immediately after the war. These ranged from wooden wheelchairs propelled by levers and arm-muscle power (I recall seeing these zooming down the Autobahn in traffic in the 1950s), to motor-powered vehicles made from bicycle parts, to Fritz Fend's 1948 Flitzer (the precursor to the Kabinenroller). After the War, only the very rich had full-size autos. 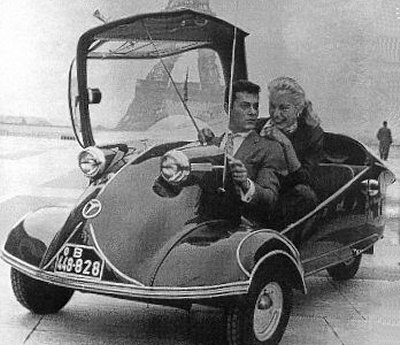 Kleinwagen were more affordable and a very common sight, especially the Messerschmitt ("Mensch in Aspik") and the front-loading Isetta ("Egg", "Bubble car", or "Schlaglochsuchgerät" [pot-hole seeking device] -- Elvis bought one). (In fact, Elvis also had a Messerschmitt, even before he arrived in Germany.) Motorcycles, motor scooters, and bicycles were even more common. It was also common to see small three-wheeled trucks (Dreirad Lastwagen), not to mention horse-drawn carts. 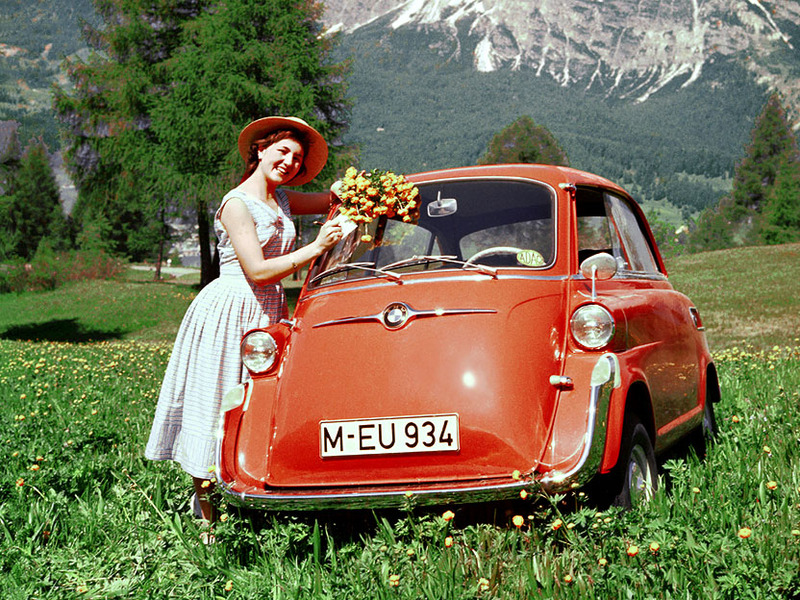 Other makers of microcars included BMW (Isetta), Heinkel (another ex-World War II German aircraft manufacturer), Goggomobil, Fuldamobil, and Brütsch (the Mopetta, a single-seater). 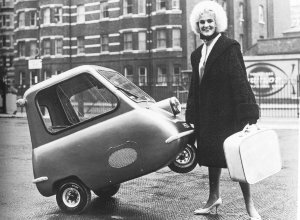 The smallest of all might have been the Peel, manufactured on the Isle of Man, 1963-65 (you can lift it with one hand). Messerschmitt, like BMW, Heinkel, and other German manufacturers of military aircraft and engines, was forbidden from manufacturing regular automobiles for some years after the War. During this period, BMW made bicycles. By 1949 it had permission to make a motorcycle, and the single-cylinder R24 appeared as its first postwar motorized product, followed soon by the R26 (I had one of these). The original 300 model Isetta was driven by the single-cylinder R24 engine; the later 600 model by a 2-cylinder Boxer engine. Dreirad? Auto? Flugzeug? (stern Magazin). Fritz Fend's Marvelous Micro-cars (English, Bill Cawthon).